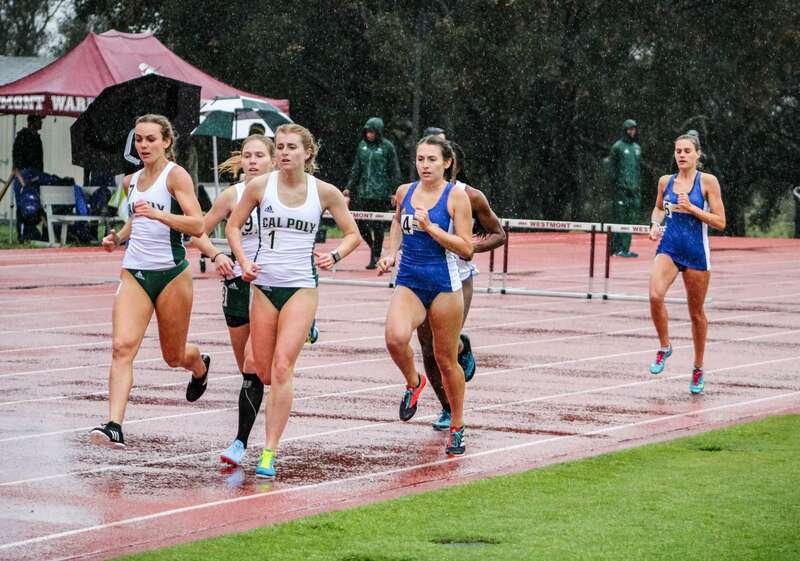 The Cal Poly track & field program took on two Big West Conference rivals in UC Santa Barbara and UC Riverside throughout a rainy Saturday at Westmont, claiming 12 event wins altogether. For the women, Cal Poly topped the rival Gauchos 97-96 and the Highlanders 112-70. On the men’s side, the Mustangs beat UC Riverside 94-85, but lost to UC Santa Barbara 105-84. The first victory of the day came in the women’s pole vault, where freshman Brooke Tjerrild, the reigning Big West Women’s Field Athlete of the Week, cleared 12 feet for her second consecutive win to open the outdoor season. Sophomore Caice Lanovaz won the women’s long jump with the best mark of her collegiate career: a conference-leading 19′ 1.5″. Cal Poly then swept the pole vault, as sophomore Matt Hunt cleared 14′ 11.5″ on the men’s side. On the track, senior Peter Cotsirilos took the 1,500 meters, earning a time of 3:54.42, followed by junior Connor Crowe in third at 3:56.08 and sophomore Robert Franklin in eighth at 4:02.83. Junior Hannah Hull led the women’s 1,500m contingent via a fourth-place 4:37.75, followed by freshman Sierra Brill (fifth; 4:40.36), redshirt freshman Melodie Leroudier (sixth; 4:45.28) and redshirt freshman Rachel Bordes (eighth; 4:47.06). The Mustangs dominated the women’s 800, as freshman Michelle Chandler won in 2:14.72, before freshman Mikaela Romanini (2:15.04) along with junior Natalie Grohmann (2:15.16) completed a clean sweep of the top three. Senior Maddie McDonald led the way for a historic day in the women’s 3,000m steeplechase coming in second place, with a time of 10:43.60 to move to No. 3 all-time at Cal Poly. Redshirt sophomore Bryanna Fuller (fourth; 10:52.00) and junior Delaney Fitzsimmons (fifth; 10:58.37) also moved to No. 6 and 10 in school history for the steeple. Cal Poly freshman Bikram Thiara won the men’s 400m hurdles with a time of 56.0. Not far behind were teammates sophomore Griffin Teague (third; 56.70) and freshman Jonathan Chagnon (fourth; 56.80). Sophomore Molly Ross won the 100m hurdles with a performance of 14.64 with Lanovaz finishing right behind her in second with a time of 15.02. Next, the Mustangs will return home with the 36th annual Cal Poly ShareSLO Invitational March 23-24.